When homeowners hear the word ‘concrete,’ they often just think outside: concrete is typically used to pave driveways or balance out sidewalks. Right? Wrong! Concrete does make a reliable and stylish driveway, but it can also be used in other parts of your home! It can be used in very unique ways, offering a host of benefits to homeowners. There are some interesting tastes that have emerged in home design. We’ve seen everything from dining room tables and side lamps, to sink fixtures and outdoor fire pits—all made out of concrete. The reason being is that concrete is incredibly durable; it can last for a long time without scratches or burns. And as a result, it’s easy to maintain, which are a homeowner’s three favorite words. Take the reasons above, and now apply them to the floor. Concrete flooring, like textured tiling and colored designs, has become an increasingly popular option for homeowners. Our personal favorite is what you can do with your driveway—take that lackluster concrete and turn it into a focal point of your home’s exterior! Reimagine that countertop space with concrete. 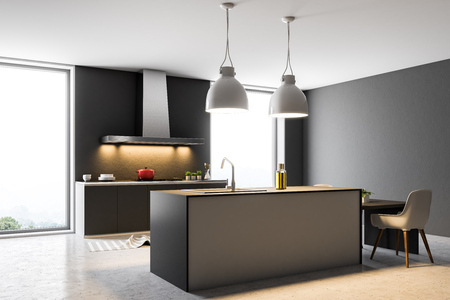 Durability is of particular value with countertops, and that clean-cut industrial look will have every visitor asking about it. With these design trends in mind, take concrete from a misconception to a new phenomenon. At Templin Concrete Construction, we have the equipment and expertise necessary to fill your driveway, sidewalks, and countertops with beautiful decorative concrete. Call us at 612-388-1945 to start planning your project today!